The pages of Hindu epic Ramayana introduce us to the notorious being called Ravana. The king of the demons with ten heads and twenty hands makes Hindu mythology really interesting. Ravana was born to parents by name Visrawasa and Kaikasi. He had two brothers with namesKumbhakarna and Vibhishana. It is believed that Ravana was the most dreadful creature ever born. His childhood was responsible to make him whatever he was. When he was a child, people were terrified of a child having ten heads and dark complexion. Let us once again go back in time of mythology and supernatural powers to get the glimpse of the life of deadly demon and incredibly scholar persona known as Ravana. Ravana's real name was Dasamukha which literally means one who carries ten heads. 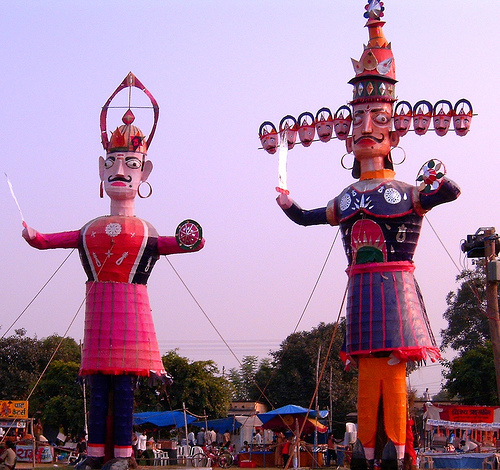 Valmiki's Ramayana narrates the story about how Dasamukhagot the name Ravana. Once Ravana infuriated the great monkey king Vaaliwho was praying on the mountain. Agitated Vaali trapped Ravana. Ravanakept howling until Vaali released him from the trapping. Since then people forgot Dasamukha and remembered Ravana. Though Ravana is looked upon as a cruel demon who annoyed the innocent, he is also known as a great intellectual in the history of Hindumythology. Under the guidance of his father, Ravana grasped vast knowledge. He learned sacred texts like Vedas. He mastered holy scripts.Ravana himself was a Brahmin but he learned the skills and techniques ofKshatriyas. The demon that was well known for his evil powers had great faith in almighty. He was a believer of the supernatural beings. Ravana was a faithful devotee of lord Shiva, one of the incarnations of lord Vishnu. While possessed with obsession to manifest Lanka, Ravana confronted Shiva. Ravana tried to move on the mountain Kailash, the home of the lord Shiva. In anger Lord Shiva punished Ravana by pressing him under his little toe.Ravana howled and danced to please lord Shiva. Then on Ravanaworshipped lord Shiva with unconditional devotion. 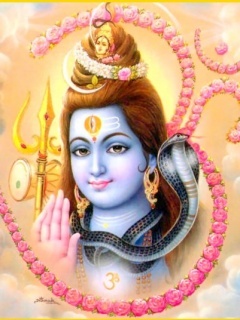 During this chancemeeting with Shiva, Ravana composed Shiva tandava stotram. Ravana had many wives but Mandodari is renowned as she was famous for her elegance and beauty. She was intelligent. Apart from legal wivesRavana was believed to have physical relations with many other women whom he had captured in the battles. There is a mention of the episodes in the Ramayana that he forced several women; amongst them was a sage-woman Vedavati. Vedavati who was infatuated with the charisma of lord Vishnu, ended her life after losing her chastity. Ravana also tried to abuse Rambha, anapasara engaged to Kubera's (the god of wealth) son. After learningRavana's advances, Kubera cursed him that if he tried to force himself upon any women, all his heads would fall off. This is one of the reasons why he did not touch Sita when she was in his abduction. Ravana was obsessed with the thought of conquering Lanka. Ravanaperformed tapas for many years to please Brahma, the god of creation. Seeing his dedication Brahma bestowed him boons. Brahma granted his wishes to be unbeatable by gods and other powers. After getting the control of divine power, he conquered Lanka. In his tenure, Lanka was a prosperous and wealthy kingdom. He leadedLanka with his skills and he was considered one of the great monarchs. Under his ruling people in Lanka were living affluent lives. It is said that they actually owned gold vessels to consume their food. Ravana was admired for his huge knowledge of weapons and sorcery. Ravana's sister Shurpanakha was fascinated by Rama and she proposed him for marriage. Rama refused her proposal as he was already married toSita. Then Shurpanakha pleaded Laxman, Rama's brother to marry her. In a fit of rage Laxman chopped off her nose. Ravana got angry and to take revenge he kidnapped Sita. Sita was in his captive for nearly a year. Later she had to go throughAgnipariksha to prove her chastity. Some facts in the mythology say that during her abduction, Ravana persuaded her to be his wife but never touched her. Other facts say that he kidnapped Sita only to take revenge of Laxman's behavior towards his sister. When Hanuman (Rama's great devotee) was on his way back from Lankato inform Rama about Sita's whereabouts, the demons in the Lanka set his tail on fire. But with his powers Hanuman increased the size of his tail andLanka was burnt. Rama with the help of Hanuman set off to Lanka once he got to know about the Sita's kidnap. 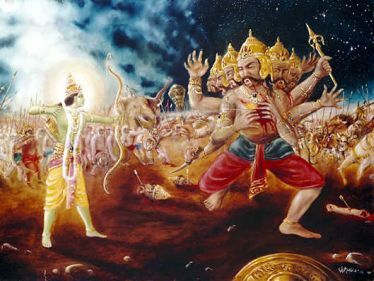 As Ravana was unbeatable, Rama had to acquire a special weapon to killRavana. Laxman got severely injured in the battle but he was saved by the magical herbs from the Himalayas. Finally Rama defeated Ravana and that was the end of the empire of Ravana. Ravana lost his life and his virtues because of his Karmas. His ego was solely responsible for his devastation. On the day of Dassera Ravana's effigies are burnt to signify the power of the good over evil. But on contrary in some parts of India Ravana is worshipped on Vijay Dashmi. Ravana is the symbol of wickedness as well as wisdom. Ravana is burnt and worshipped for ages and will be burnt and worshipped for ages.